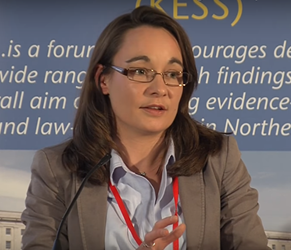 Dr Katy Hayward gives an outline of what border controls could mean for different types of border with the EU after Brexit. This is a pared-back and simplified overview of complex matters. It is the second draft of a work in progress. The author welcomes corrections, comments and suggestions. To download the slides, please click here. 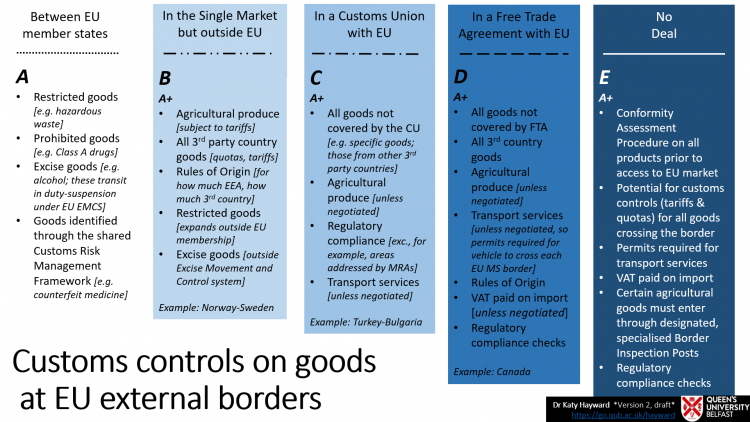 Slide 1 shows the different scale of customs controls on the movement of goods across an EU border, depending on the trade relationship a country has with the EU. 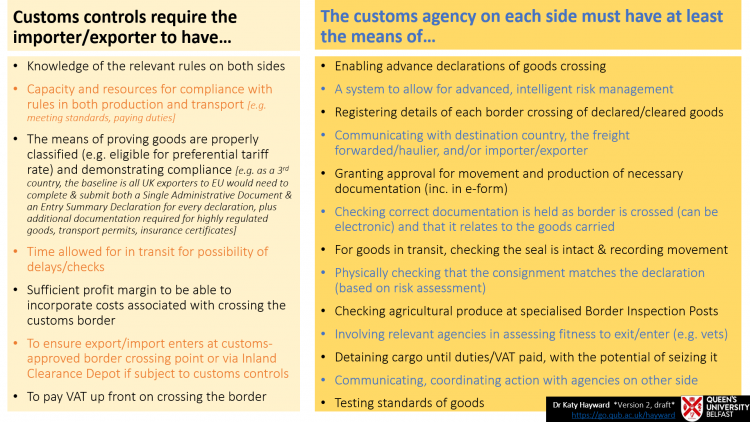 Slide 2 shows what customs controls mean in practice for operators and customs agencies. 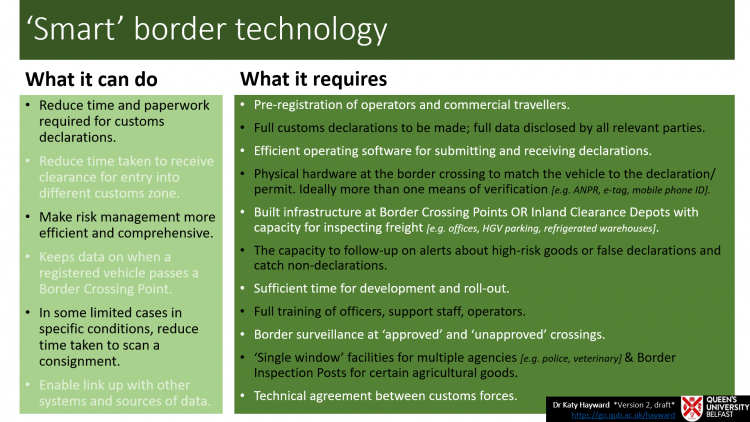 Slide 3 shows what technology can do at a border and what is still nonetheless required to enforce a customs border. 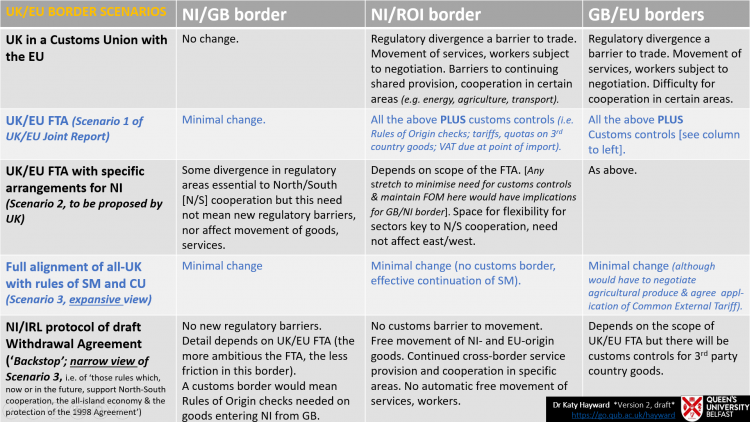 Slide 4 shows the possible scenarios for UK/EU, GB/NI and NI/IRL border in light of the UK/EU Joint Report of 8 December 2017. Viewed from England it is all essentially hearsay what happens now at the land border between northern ireland and the irish republic. As I understand there were still routine border checks after the UK and ireland both joined the eEc and its customs union, until the advent of the EU single market was deemed to make them unnecessary. Is that correct? And is it the case that there now never any checks at the crossings, or is it just that there are no routine checks and no random checks but there are sometimes still intelligence driven checks? if so what was the indispensable change which took place, the beneficial effect of which could perhaps be replicated in another way for after the uk has left the EU and its customs union and single market? 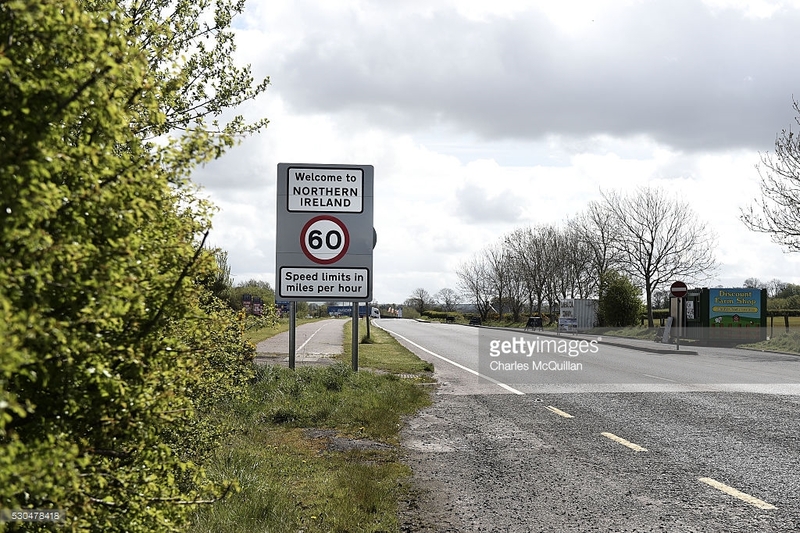 is the eu assuming that once out of the Eu the uk will be deliberately sending defective or illicit goods across the border which will have to be intercepted by the irish authorities? If the uk is sufficiently trusted to uphold eu law in that regard now, so there is little or no need for any checks at the border, why should the eu suppose that the UK will become untrustworthy once it has left? Have a look at the border. THere’s nothing there. And as for why the UK may become untrustworthy, have you been following the English newspapers at all? according to that view of the border, it looks like there are cameras there already?? AS FOR EU LAW, I DON’T THINK IT’S A QUESTION OF the uk ‘UPHOLDING’ EU LAW or otherwise, SO MUCH AS CONFORMING TO the effect of EU LAWS WITH UK LAWS OF EQUIVALENT EFFECT, AS WOULD BE THE CASE WITH ANY comprehensive FTA. CANADA DOES NOT really transpose EU LAW into its law and vice versa but an agreement on mutual recognition of conformity assessments on manufactured product safety etc is part of ceta. THAT DOES NOT MEAN ZERO CHECKS BUT IT DOES MINIMISE THEM for a huge array of goods, as does the removal of 99% of customs duties. (rules of origin complicate things but ceta has ‘cumulation’ agreements which mitigates this to an extent) the terms of a UK-EU FTA will establish how many checks are needed, where they take place, how they are carried out, by whom, etc. it is this process which will establish the level of friction as it will establish to what extent rules will diverge from the start (at which point there is no difference in rules on product standards) and how divergence will be ‘managed’ in future. the devil will very much be in the detail! which is why it makes sense to discuss the future trade relationship at the same time as the irish border question. the issues are inseparable. plenty of people may not like brexit and the uk govt’s pursuit of it, and that’s understandable, but what makes Canada more trustworthy than the uk on conformity to rules on product safety etc?